Our favorite guests from Switzerland are back at the Blue Iris B&B, after a 3 year absence. Sandra and Sandro first visited us on their honeymoon! Now they are back with a family addition, Noah, as well as his maternal grandparents! We had a lovely 6 day visit; helped Noah learn some English words; learned how very clever he is; as well as saw how big he has grown since we saw him last in Switzerland 16 months ago! Noah LOVES firetrucks and does a very good imitation of how European fire trucks sound… now his word for firetrucks is DuDa! DuDa! Needless to say as the Canadian grandparents we have all sorts of DuDa’s around the house! He was lucky enough to visit with the Penticton Fire Hall #7 and sit in the fire truck! 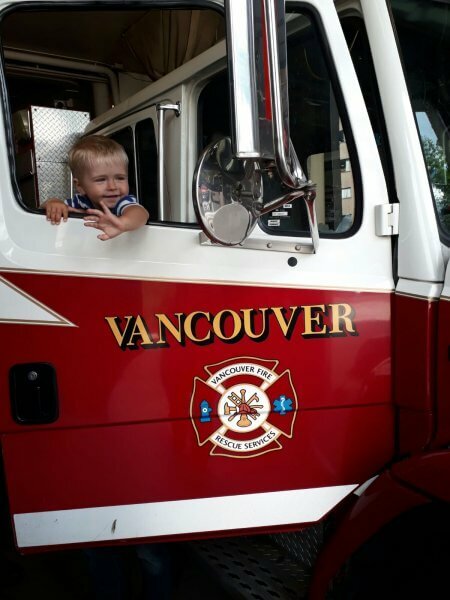 As they journeyed on to Vancouver Island and then Vancouver, Noah got another treat in a Vancouver fire truck! Lucky little boy! What a treat for us! Thank you all for your visit! We will treasure this special week you have spent with us…. until we see you again, Safe Journeys!